Last week, two events were held on the topic of Global Citizenship Education (GCED) in Lisbon, Portugal. The Ban Ki-moon Centre for Global Citizens’ partner UNESCO APCEIU hosted a two-day “2018 Europe and North America Regional Global Citizenship Education Network Meeting” in cooperation with UNESCO and GENE (Global Education Network in Europe) from November 21st to 22nd. 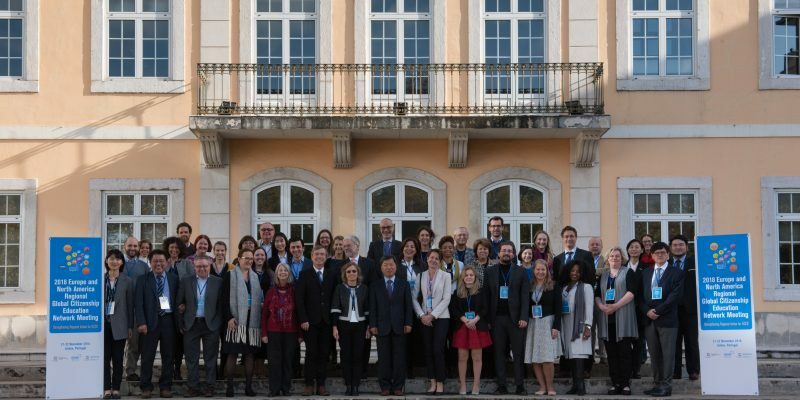 On the following day, GENE organized an international conference on “Building a World of Justice and Solidarity: Global Education in the School System” in cooperation with the Portuguese government and UNESCO. The two events gathered educators and researchers from universities and academic institutions, representatives from the ministries of education, stakeholders from inter-governmental organizations and NGOs, and others from different sectors. An interactive platform was provided for the participants to actively share their ideas and expertise on GCED for the successive days. On behalf of the Centre, Associate Minji Kwag presented its work and advocacy for the subject, including its launch of the Global Citizenship Initiatives Portal, an online course on the SDGs and the notion of global citizenship as well as other upcoming courses, the annual Global Engagement and Empowerment Forum that the Centre hosts, and its number of engagements in other meetings and workshops on GCED. These regional meetings and networking opportunities let the stakeholders seek for the betterment of the education system not only within the region of Europe and North America but across the world, pointing out the need of overall development of the global education system and cooperation between academic, governmental and international actors. The outcomes of the discussions held during the two-day workshop hosted by UNESCO APCEIU will be publicized as a report. The report will show suggestions on how to advance GCED specifically in Europe and North America and how to implement and develop the education into working solutions for global challenges that the world faces.